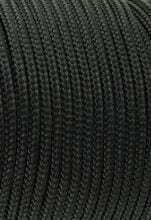 You can pick up polyester cord in whatever length or configuration you require from Rope Services Direct. We sell high quality polyester cord alongside twines made from other natural and synthetic fibres, all manufactured according to your exact specifications. Cord and twine are fairly similar, with cord typically being made up of several interwoven yarns, rather than individual threads. This gives our polyester cord plenty of innate strength, to go along with the durability that comes with this type of synthetic material. There are very few things that will compromise the physical integrity of polyester . It will not flinch in the face of moisture, mildew, direct sunlight or almost any other environmental factor. Like polypropylene cord , it will also stay in one piece if splashed by chemicals. So, for use in commercial and marine environments, it is a good choice. Polyester cordage can also be a sensible option for applications in the home, whether you have a bit of DIY that needs to be completed or a craft project that can take advantage of its capabilities. Unlike nylon cord it will not stretch, but stays rigid when pressure is applied. This is important for safety in domestic settings. We want you to buy polyester cords with confidence, so if you have any uncertainties about the products we sell, contact the Rope Services Direct team today. You can use the form on our site to send us an email, or call 01384 78004 to speak with someone immediately. Polyester Cord Overall rating: 5 out of 5 based on 6 reviews.